Underneath, there’s a Truetone CS12 powering everything and a ProStage Remote Wah that can be MIDI-controlled by the Voluum. A friend soldered the special MIDI Out cable described on Voluum manual page 39. Now, the custom made yellow box can control the Voluum with the two footswitches on the right side; while the two footswitches on the left go to the ES-5 Control In. From there, they’re assigned to control additional Voluum features. Most of the time, top left is Voluum Compressor on/off, bottom left is LFO on/off, and top/bottom right is Voluum preset up/down. Love it! Will make some videos showcasing the board and the Voluum on my YT channel soon (https://www.youtube.com/watch?v=8BH9fgCSuEM). When I set my Voluum to send MIDI expression, the MSB CC value won't go above 126. I recalibrated the pedal twice, and made sure range is set to "0 to 127" in the editor. When in 14-bit mode, maximum is MSB=126 and LSB=127. When in 7-bit mode, well, maximum is 126. This is very messy when trying to do Whammy effects with the Line6 M5; your octaves will not be in tune anymore. Do I have a faulty unit, or is this a firmware bug? It’s a great feature that the effect blocks of the Voluum can be enabled individually through CC controllers. This works mostly fine, but theres some quirks. First one that I encountered: When you send an effect enable CC with a ES-5 patch change, Voluum will ignore it. I recorded the patch change on Cubase; as the MIDI list editor shows, ES-5 sends bank select LSB and MSB simultaneously, then Program Change, then the CC (in my case: CC #80 at value 127, assigned to switch on the Voluum Compressor). Voluum will ignore the CC, Compressor stays disabled. Though, when I have a footswitch assigned to send CC#80=127 in the same patch, and I hit this footswitch, the Compressor will be activated. So, appearantly something goes wrong when a Program Change message is directly followed by a effect enable CC. Interestingly, this ALWAYS goes wrong with effect enable/disable CCs after PC, but NEVER with Tuner enable/disable or Bypass on/off after PC. So it cannot be a general "poor buffering of CC incoming right after PC" problem, but must be some more specific bug. Patches 111 and 112 on my ES-5 both call up Preset P00 on my Voluum; which is a basic volume pedal preset with all other Voluum sections disabled. Also, both patches 111 and 112 have the ES-5’s external footswitch #1 assigned to “enable/disable Voluum Compressor”. Now, while in patch 111, I press Ext FS #1; ES-5 sends CC80=127, Voluum Compressor becomes active. I change to patch 112; Voluum Preset P00 is reloaded, resulting in Compressor being off again. Now, when I press Ext FS #1 again, ES-5 will send CC80=127 again. Nothing happens. I press FS #1 for the 2nd time, ES5 will send CC80=0, again nothing happens. Pressing FS #1 for the 3rd time (again CC80=127), the Compressor will finally be activated. Strange, huh? 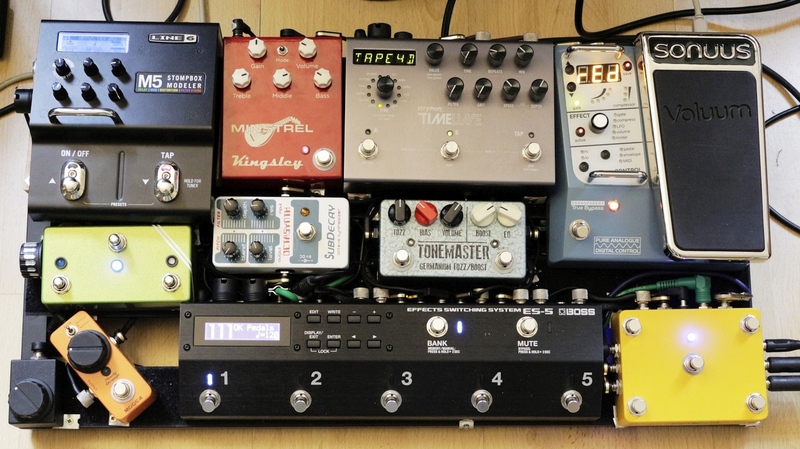 When you send a Program Change command, you want your pedals to react, right? Else, you might get into trouble on stage. Now, when Voluum is in Preset Edit Mode (maybe because you just wanted a tiny bit more tremolo depth during a song), it will ignore incoming PC messages. Maybe this was implemented with a good reason: To avoid that you unintentionally lose your recent edits. But IMHO making live performance reliable must have priority over making preset editing foolproof. In other words, incoming PC messages should always kick Voluum out of Preset Edit Mode. Suggestion A: Add a 4th bypass mode called “Freeze Bypass”. In that mode, activating Bypass will not actually bypass the Voluum; but rather, Voluum will stay on the same preset, with the last pedal controlled values before pressing Bypass – i.e., no matter whether the pedal controlled Volume and/or LFO speed and/or sent a certain CC, those values will be frozen. Instead, moving the pedal now will control a specified external CC (MIDI Channel, CC# and Range for this programmable per preset). After un-bypassing, the pedal has to cross the point where it was set before bypassing to become active again (to avoid volume jumps). So, you could set up Voluum preset 01 to be a standard volume pedal, but when bypassed, it becomes an expression pedal for the M5, while the volume stays at where you had set it before; and preset 02 to be a Tremolo with pedal controlled speed, that turns into a Timeline expression pedal with frozen Tremolo speed when bypassed. Suggestion B: Add a “Freeze local pedal” CC controller that will make the Voluum do basically the same as with activated "Freeze Bypass" as described above. – add had hold functionality to external footswitches. Like, kick FS1 for 1 preset up, hold FS1 to scroll up presets. Or kick FS1 to enable/disable compressor, hold FS1 for n seconds to enable/disable gate. In general, the Voluum adds a programmable volume level per preset to your setup. That’s fantastic. Now, it would be great to have a MIDI controlled volume trim independent of the other Voluum functions. Why? Say, you have a ES-5 or ES-8. You want to create patches for creative band rehearsals; i.e. patches that allow some spontaneous changes WITHIN the patch to find out what works good in a certain song, rather than unflexible presets. In such a patch, you want to assign FS A to Voluum Tremolo on/off, FS B to Voluum Compressor on/off, and FS C to a +6dB solo level boost; and you still want to use the Voluum as volume pedal. Currently, this is not possible: ES-5/ES-8 can't assign footswitches to the internal mixer level, so you cannot take the boost from there. Of course you could switch to a different Voluum preset that has the +6dB boost; but then, you would not be able to carry over the current on/off settings of Trem and Comp; also, you would need to sacrifice TWO footswitches (since currently, ES-5/ES-8 cannot toggle between two PC commands with one Footswitch). You could switch the volume control method from “pedal” to “MIDI”, but then you would lose Volume pedal functionality. You could use a workaround and utilize the LFO section as MIDI controlled boost (MIDI controlled LFO, Square Wave, 0% Duty Cycle, desired min/max dB values for Depth Hi and Lo ), but then again you would lose the Trem in this preset. As already suggested in another thread, it would enhance creative MIDI use if the Voluum could send envelope data via MIDI. In the best case, with some controls (range, attack/release). And of course only if explicitely enabled, or else it would spam the MIDI chain with unnecessary data. This could be used for turning any MIDI delay into a ducking delay, or for touch wah/envelope filter functionality, and much crazier stuff. And even better, if the built in USB-to-5-pin MIDI interface could also transmit SysEx. A great post, thank you! I'm getting the same. It is probably a bug, we will check. Patch change takes some time, so I'm not surprised MIDI for enabling the controllers has problems immediately after a patch change. It is probably being processed before the patch change has completed. We'll look to see if this can be deferred until the patch change is complete. Ignoring MIDI program change was by-design. As you suggest the reason was to avoid loosing changes if you somehow receive a program change you didn't expect. But you are right about the tuner, this shouldn't cancel the edit. We'll investigate both of these things. A trim per preset? Or a global trim (so it remains set when you switch presets)? Another update... some bugs have been fixed (will release soon for testing once a few other things have been checked). FIXED: this was caused by the new scaling that was added that allows you to rescale the controller value. Caused by rounding issues, should now be correct. This also affected the LFO effect controllers and the Volume effect controllers that were sent. FIXED: Controllers were assigned higher priority than program changes (because these are received far more frequently, so it makes processing a little faster). However, if program change and controllers are received at almost the same time this priority would reorder the messages so the controllers were processed first. Now controllers have lower priority so the program change will be handled first. A side-effect is if you send a controller then program change, it is possible the program change will be handled first. I don't think this will cause any issues? This might be because the controller hasn't changed it's value. We're looking into it. FIXED: When the MIDI controller for LFO2 was updated, it actually updated LFO1 by mistake. It now udpates the correct LFO so everything should work as designed. Now, I could use these 10 Voluum presets for almost any ES-5 patch that I would want to create; I would just send CC enable commands for the effects (Gate, Comp, Trem) needed in the specific patch, Trem speed would adjust to the ES-5 Master BPMs, I could set up Trem and Comp to have Trem Depth and Compression level controllable via MIDI. And I could use the volume trim to set a specific level for each ES-5 patch. And also, assign some ES-5 footswitch to increase that level by a few dB for a solo boost. This would work either way with a MIDI volume trim on global or on preset level. Now long-press on the footswitch while in edit mode will not take you out of edit mode, and thus not loose your changes. Due to other work we have going on, the other feature requests will need to be added later. But some of them, like a global volume, are hopefully not too much work to add when we get time to look at it. great, still checking, but so far everything seems to work. This is really fast and fantastic customer service, thanks a lot! 1. Sending CC goes perfectly from 0 to 127 now, thanks! 2. Also, Duo MIDI LFO works perfectly. - My preset P01 is Volume pedal only. P01 is Volume pedal plus LFO. P06 is only Gate + Compressor, nothing esle. - ES-5 patch 251 sends PC=P01 to the Voluum (and no CCs), patch 252 sends PC-P02. - When I power up the Voluum, in will come up with the previously selected preset in the correct configuration. - Now, as soon as I send a PC (by either selecting ES-5 patch 251 or 252), it will call the appropriate Voluum presets, but with all effects deactivated. - Once I send a CC to activate a certain section (Volume or LFO), it will stay constantly on, even after sending program changes P01/P02 to Voluum. - However, changing Presets with the up/down buttons on the Voluum (or in the Editor) will result in the correct behaviour: P01 will have only Volume enabled, P02 will have Volume and LFO enabled, no matter what sections were active previously. - Now, after sending PC=01, I manually select P06 with the Voluum up/down buttons. As expected, it will have only Gate + Comp enabled, just as saved. But when I then send CC="activate LFO", it will not only enable LFO, but also enable Volume and disable both Gate and Comp. That is, it will revert to the configuration I had before manually selecting P06, plus add the LFO I just activated via CC. Thank you for checking and confirming what has been fixed. Keeping the tuner enabled while a preset is being edited is not simple, so I though it was best to avoid this just now to avoid possible bugs. Your description for (3) has lots of detail which is great. I will investigate and see what I can find. james wrote: Now long-press on the footswitch while in edit mode will not take you out of edit mode, and thus not loose your changes. I did not like this change, sorry . Entering to preset selection mode or tuner mode needed a long press on the foot switch, which was hard to do by accident. Thus this was already foolproof. There was no need to remove this function. Now I cannot enter to preset selection mode if the preset is edited. First I need to cancel the edits by bending over and long pressing on the Save button by hand and then I can long press on the foot switch. As Sascha explained later, he was asking for keeping the edits while the Tuner is activated, instead of removing this function completely. Also he was giving an example in contrast to PC messages.